Today I’m sharing some of my favorite finds and third trimester essentials for surviving + thriving in the final months pre-baby. 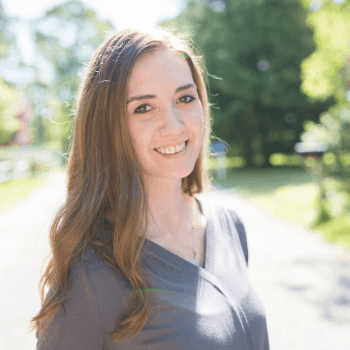 The end of pregnancy is tough—your body is physically exhausted all of the time, you are ready for it to be over but also rushing to finish last minute things. Here are a few things to make it easier! The third trimester of my second pregnancy came upon me super quick. I kept thinking throughout the second trimester about how I have so much time to get everything done and then all of sudden I was at a third trimester doctor’s appointment and my doctor asked if I was starting to feel prepared and I realized I should probably get a move on things. But that’s a different story. Today is about the things that are making life a little better, more comfortable or just downright necessary for life in the third trimester. As the belly gets heavier and heavier, it takes a toll on your whole body, esepcially your back. Finding a good maternity support belt is super helpful, and it also really helped with reminding me of my limits with SPD (Symphisis Pubis Dysfunction). This one is very adjustable and was great for my active job. Speaking of support belts, I’m loving a design of leggings that were sent to me for review. The Goodbody Goodmommy Maternity Leggings have a built in support belt that is flexible and extremely comfortable. It provides the benefit of extra support while being active (the material and design was crafted especially for activewear while still looking good for everyday wear) and the bonus is you can sit comfortably in these leggings while wearing them (which you cannot do in a support belt for long periods of time). Find these awesome leggings here. My cardigan was also sent from Goodbody Goodmommy, and it serves as a multi-purpose item and nursing cover! See my IGTV review for more details on how it works! I’ve been literally living in these, so lightweight for summer and just the touch of extra support needed. Talk about belly itch! With skin stretched as tight as it can go these last few weeks have been horrendous for itchy skin. Charlie thinks it is a game that the baby is making me itch and likes to “help” scratch. Soft lotion (yes I’m really using that one because it is so great!) and body butter have been my go to products this month. It is so important to stay hydrated all pregnancy long, but especially leading up to delivery. Did you know that being dehydrated could actually increase contractions or the possibility of preterm labor? My doctor (and lots of others) suggest drinking water if having contractions (especially when you are not sure if they are real ones or Braxton Hicks) to see if that helps them stop. So find a water bottle you don’t mind carrying everywhere, and get your drink on! Bonus if you find one now that will work for long nursing session later on (read—can use one handed like this one) or a straw cup that will work great as part of your hospital bag. Sleep is sporadic at best and unbearably uncomfortable at worst during the third trimester. It is funny how people like to say “sleep now before the baby comes” when in reality as hard as you try just having a big ole bump makes it difficult. Add in restless legs, sciatica, SPD, and other pregnancy related ailments, and it can be downright impossible. While pregnancy pillows don’t necessarily mean you will sleep through the night, they do help to support both belly and back and make it a little easier to prop up all of the parts that need it. Here are some great options for a variety of budgets. 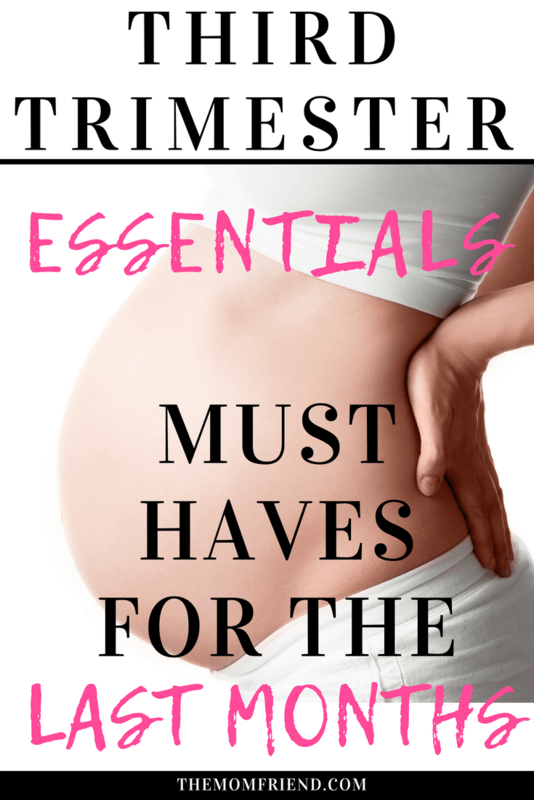 What other Third Trimester Essentials am I missing? Let me know what you love below! And follow The Mom Friend on Pinterest where I’m constantly sharing the best tips for pregnancy, labor and delivery and postpartum recovery!